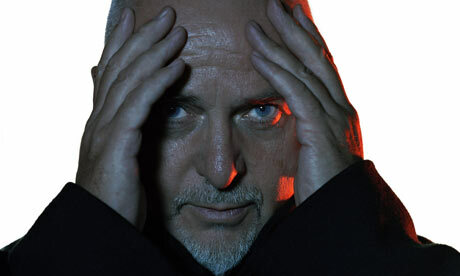 I’ve just had my first listen to songs from Peter Gabriel’s new album Scratch My Back and I love it. It’s deep, rich, beautiful, sad, joyous and very touching. His music hits me in an emotional place and has often brought tears to my eyes; this album is no exception. It’s orchestrated and is all cover songs! Gabriel does songs from artists who agreed to cover one of his songs in return. Not what I was expecting, but it’s surely an innovative album – not a surprise from an innovator like Gabriel. There are some interesting vocal effects that make me think of early Gabriel work from his solo albums. He’s been one of my favourite artists for many, many years. I’ve seen him live a few times too – the first time in the 80’s on the Shock The Monkey tour. He’s on tour this year in support of his new album, with an orchestra, and billed as with “no drums or guitars”. I really enjoyed the album as well. I’ve heard really mixed reviews…many people find the album boring or complain that he doesn’t do it like the originals(!) (Isn’t that the whole point of doing covers? To bring your own sensibility and interpretation to the process?). I thought Gabriel’s interpretations brought whole new life to some classic songs (and some songs I’d never heard before). Boy in the Bubble was a revelation and I’d never really listened to the lyrics of Listening Wind until I heard this version (although I’ve heard the Talking Heads’ version many times), and the song is more relevant today than it was when it first came out. All in all, an excellent album. Gabriel has never disappointed me and I’ve been a fan since the early days of Genesis. Gabriel never compromised, for which I have much respect, and he has no fear of having social commentary in his songs. Thanks for the review. I agree whole-heartedly.